The Hunt of the Unicorn was a work from the period of 1495–1505, where noblemen are hunting in a quest to capture the unicorn, thought to possess magical healing powers. Finally after capture, the unicorn is killed. However, the unicorn resurrects itself and is thought to symbolize immortality. Here we see the regal huntsmen pursuing the capture of the unicorn in the woods. It is a part of the larger work called "Unicorn Captive and Unicorn Hunt". 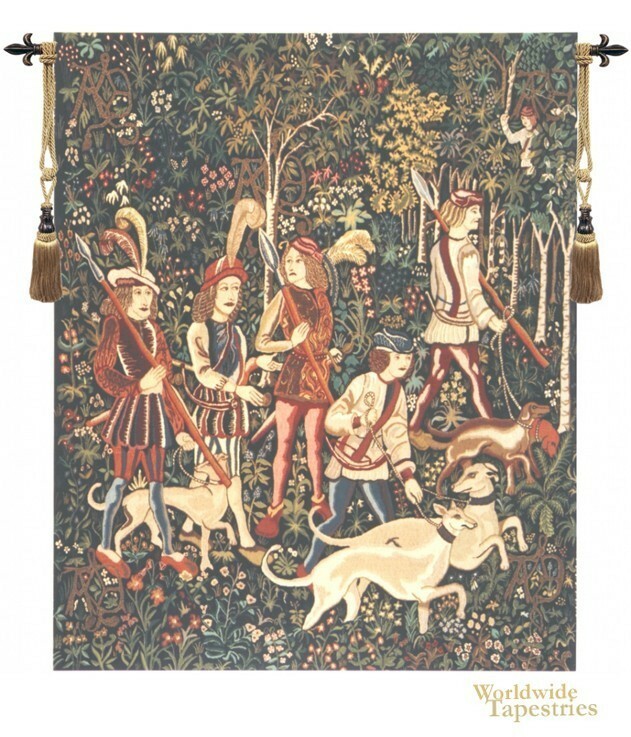 This unicorn art tapestry "Unicorn Hunt - no border" is backed with lining and tunnel for easy hanging. Note: tapestry rod and tassels, where pictured, are purchased separately. Dimensions: W 54" x H 68"